November 16, 2012 By Grant Cunningham & filed under All Articles, Defensive Fitness. Unfortunately it’s more complicated than just plopping the charge card on the gun store counter. Whether or not the problem has a solution — and what that solution might be — depends on the individual and to what use the gun is being put. Here’s something you probably know even if you don’t want it to be true: we’re all getting older, which means our body parts are getting older too. I don’t like it any more than you do, but it’s a fact of life! We can get plastic surgery and hair transplants to give us the outward appearance of youth, but mechanisms like our eyes can’t be as easily overhauled. As we age it becomes increasingly difficult for our eyes to rapidly change focus, to focus on objects that are close to us, or to differentiate between colors. Our eyes focus on objects by changing the shape — the curvature — of the cornea and the lens that sits behind it. This process is called accommodation, and as the years pass, our corneas and lenses become less elastic and less able to change shape. This condition is called presbyopia, which is defined as the loss of accommodation. It starts to occur around age 40 and means that our eyes can’t deform as much as they used to, which in turn means their minimum focus distance becomes farther and farther away. Even if we can still focus closely, it takes more time to do so. That’s because our eyes don’t change shape as quickly. When we’re young, our eyes can change their focus point very rapidly, but they slow down over time. It takes longer for our eyes to get to any given focus point, and eventually they don’t get there at all. Diabetes, high blood pressure, and smoking aggravate this degenerative process. That’s not the only problem. The muscles that open and close our pupils also age, making reactions to changing light conditions slower and less precise. While that’s happening, the cells in our retinas lose some sensitivity, causing colors to appear dull and reducing the contrast between different colors and brightness levels. I don’t know about you, but I could live with all of this except for one tiny detail: it makes shooting harder! How Does This Affect Shooting? This normal degeneration of our eyesight certainly makes recreational shooting less enjoyable, but can make defensive shooting less reliable. The former is an annoyance, but the latter is a serious problem. In those cases where we need to use our gun sights (remember that not all shooting problems require that we do), the standard procedure has always been to focus on the front blade and let the rear sight and the target blur. As presbyopia sets in, the ability to rapidly shift focus from the target to the sights is reduced, and sooner or later the minimum focus distance exceeds the length of our outstretched arms. This means that the front sight is always blurred and it’s not possible to focus on it without glasses. Focus problems can happen in conjunction with, or separately from, a reduction in contrast and color perception. This makes the sights harder to distinguish from the target or from each other (front to rear). A person with normal eyesight finds it’s generally easy to tell that the sights are darker or lighter or a different color than the target at which they’re aimed, and that the front sight is separate and distinct from the rear. As contrast and color perception decline, it becomes harder to separate where the sights end and the target begins. Even if the shooter can focus on the front sight, it’s hard to tell where the sights are actually pointed! Combine a loss of accommodation with a reduction in contrast and it can be nearly impossible to see and align the front sight, rear sight, and target. In other words, for those times when we need to use our sights, we’re not able to do so! Normal defensive shooting stance is aggressive, with weight forward for maximum recoil control. 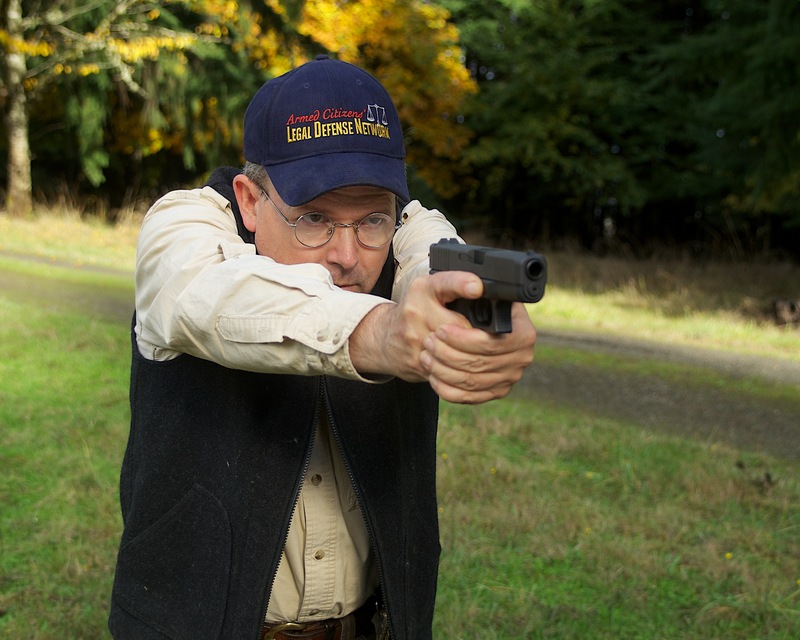 Trying to look through bifocals results in a leaned-back, unstable stance that gives far less control over the gun. One solution for contrast issues is simply to paint the front sight with bright, tough acrylics. Carefully filing out a too-narrow rear notch often dramatically improves contrast between the front and rear sights. Use a fine jeweler’s needle file and go slowly. Fiber optics are a popular choice for high-contrast sights, but have significant disadvantages. When someone says, “I’m having trouble picking up my sights,” it’s important to know exactly what he means. Is he having a problem getting the front sight in focus, or is the problem that he can’t differentiate the sights from each other or from the target? The answer will determine if there is a hardware solution. If the sights are out of focus, it’s possible to simply wear prescription glasses cut for that distance (reading glasses). That works fine on a nice, calm range — but in a defensive encounter, there may not be time to put the special glasses on, or they might get knocked off during the fight. This leaves the shooter right back where he started, and perhaps in worse condition! 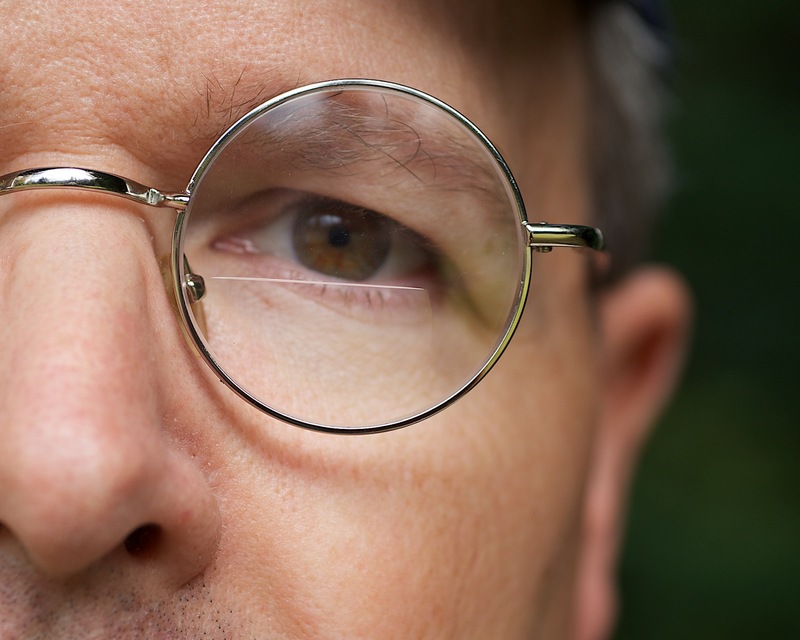 Wearing bifocals is a fact of life for many of us with vision issues. The problem with bifocals is that they force the shooter to tip the head back, which in turn forces him to stand up straight. Not only is that posture not congruent with what human beings do in a fight, it’s also impossible to maintain any sort of multiple-shot recoil control. Some shooters have bifocals ground at the top of their lenses so that they look through the bifocal when in a good defensive shooting stance. This solution has the same drawbacks as the separate reading glasses, and is more expensive to boot! Other than specially made glasses, there’s not a whole lot that can be done about a focus problem. 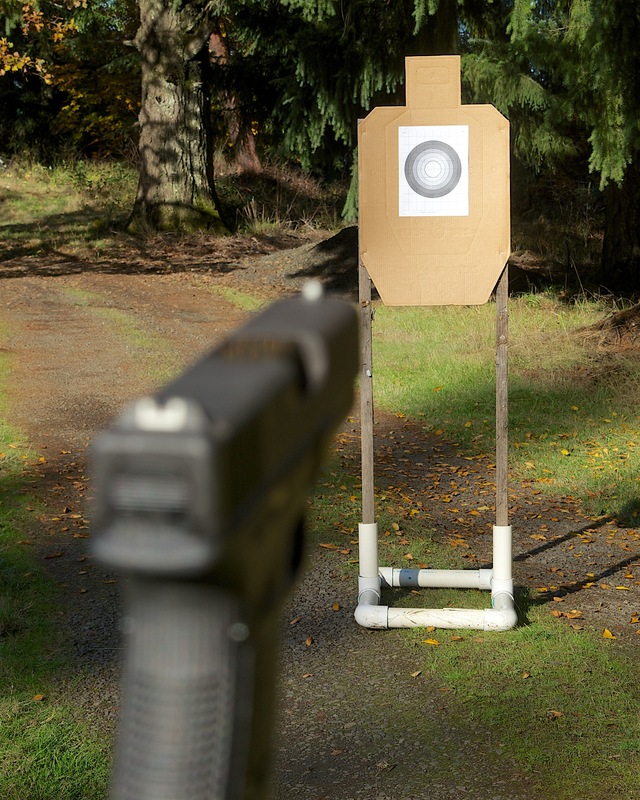 Some people buy larger sights (“Big Dot” and “Express” sights are common examples), hoping that the bigger the sight, the easier it will be to focus. That really doesn’t work; the focus problem is a matter of distance, not size. Installing a bigger front sight just means that the out-of-focus blob will be bigger — not sharper! The issue of insufficient contrast, however, does benefit from sight change or modification. The easiest solution is to paint the front sight a different color than the rear — preferably a very bright color. This increases the contrast between the two and makes it much easier to separate them when in the field of vision. The bright color also makes differentiating the sights from the target, as very few targets are fluorescent orange or green. There are kits available containing several colors of bright, tough paint designed specifically for sight applications. 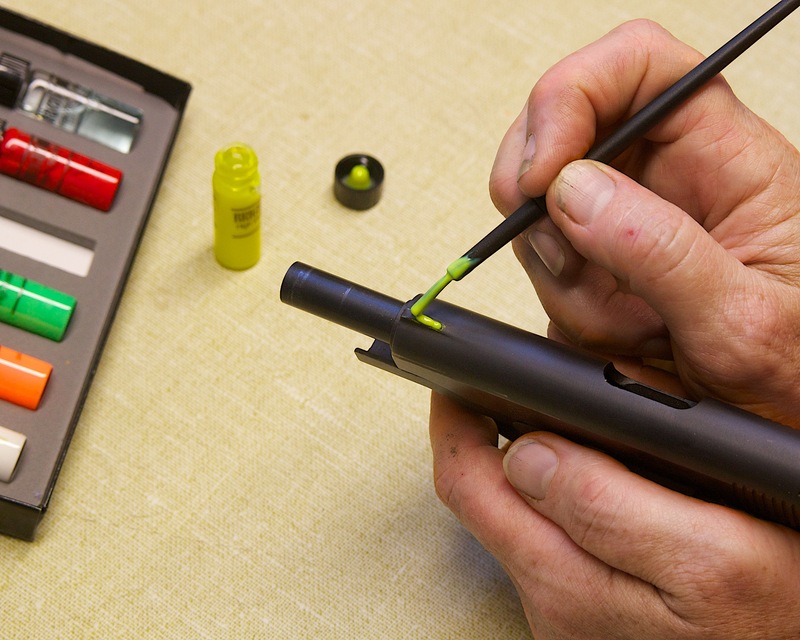 A variation on the painting trick is to have a plastic insert milled into the front blade. This was the primary factory configuration on many S&W, Colt and Ruger guns up through the turn of the century, though much less common now. A gunsmith can easily install such an insert on any ramped front blade. Sometimes slightly widening the rear notch by itself is enough to increase the contrast between the blades. This can be done by a gunsmith using a mill, or at home using a fine-tooth Swiss pattern file. 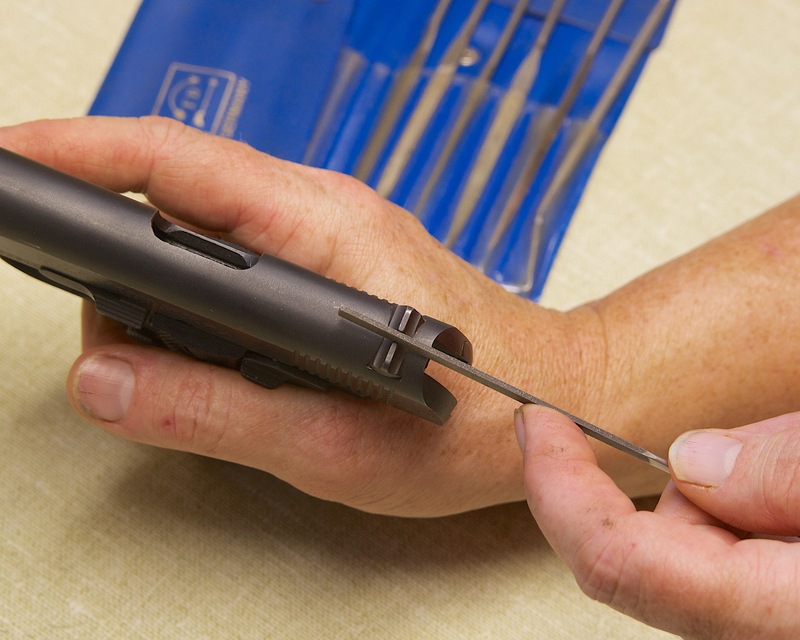 Great care must be taken to remove exactly the same amount of material from both sides of the notch, or the windage of the gun will be affected. One time-honored way to make the sights easier to differentiate is to have a gold bead installed in the front blade. 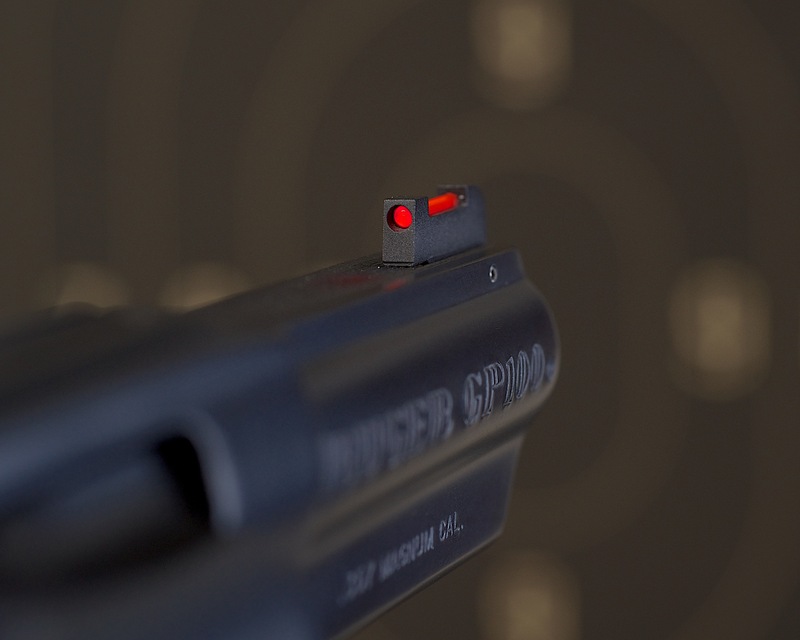 Commonly referred to as a “McGivern Bead,” from famed gunwriter and shooter Ed McGivern, the gold bead stands out in a wide range of lighting conditions and against a wide variety of targets. It’s important that the face of the bead be flat instead of domed, and finished with a non-glare matte surface. If this isn’t done, light reflections from various parts of the curved shiny surface will cause dramatic changes in either windage or elevation as the light changes. It’s also important that the bead be actual gold — 14k or better (I much prefer a 22k bead) as opposed to brass. Gold has a unique quality in that it seems to stand out no matter what the light conditions, and it certainly doesn’t darken the way brass does. A modern and very popular version of the gold bead is the fiber optic sight. The front blade is drilled and milled to accept a brightly colored acrylic rod that collects and channels light to the ends of the rod. One end is left unobstructed and pointed toward the shooter, producing a very bright-colored dot of light. These are remarkably effective in surprisingly low light levels but have the drawback of being fragile. The light pipes can break and/or fall out, rendering the front blade nearly useless. The fiber optics also have a tendency to “bloom” in very bright light, meaning that they appear to have a halo of diffused light around the dot. This makes them seem less sharp and makes it much more difficult to judge their centering in the rear notch. Some colors are worse than others for some shooters, and it’s a good idea for each individual to test the sights under the conditions they’re likely to be used. Tradition calls for a sharp front sight, with the target blurred in the background. 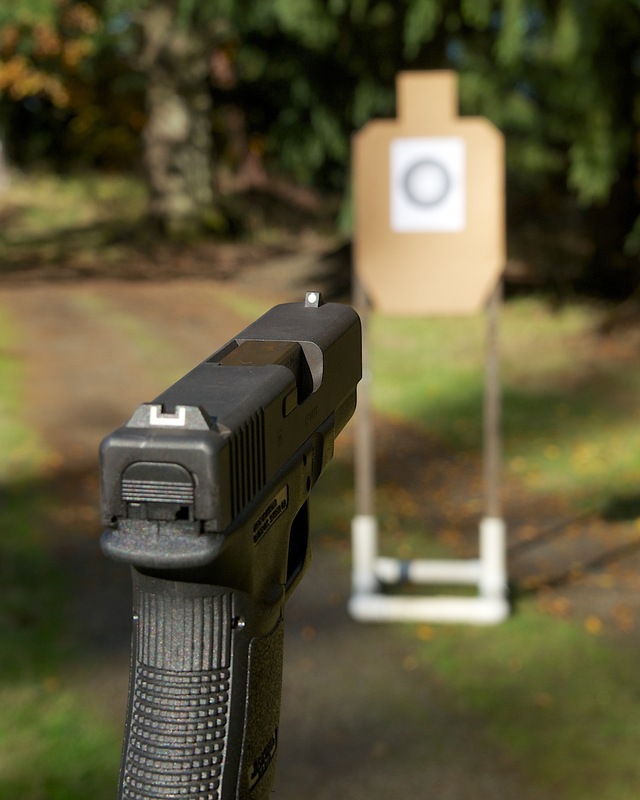 Excellent shooting can still be done by focusing on the target and letting the sights blur. One strategy that works well with both focus and contrast issues is to stop trying to focus on the sights themselves! I know, we were all taught that if we didn’t focus on the front sight, we wouldn’t be able to hit anything, but as it happens, that’s not entirely true. Something has to be in focus in a sight picture — but that something doesn’t have to be the sights! If the sights are aligned and placed on the target normally, but focus is kept on the target instead of the sights, it’s possible to make accurate hits on surprisingly small targets at surprisingly long distances. Everyone can focus on the target, and it greatly reduces problems with contrast loss. It’s easy: simply focus on the target and align the sights as you normally would. I call it “looking through” the sights: you still see them, but they seem to be superimposed on the sharp target. The hard part is forcing yourself to do it. As my vision changed, I spent years trying to get my sights in focus, even though I simply couldn’t. The result was that nothing was sharp in my field of vision — neither sights nor target — and my shooting suffered. When I finally figured out that something needed to be in focus for the gun to be aligned, I forced myself to focus on the target. It took some doing to break decades of “Front sight! Front sight!” habituation, but once I did, my shooting improved dramatically. Today I need bifocals to read the newspaper, but I shoot better than I did before I got glasses — simply by focusing sharply on my target. Give it a try, but be sure to concentrate hard on not shifting focus off the target. It works, and you might be as surprised as I was when you find yourself shooting better than you have in a long time. Whether you change your sights or change your technique, don’t give in to deteriorating eyesight. It’s possible to compensate for most losses and in some cases actually improve your shooting. Carefully analyze exactly what kind of a vision issue you have and make appropriate changes to compensate. You don’t have to give up shooting, or make yourself less able to survive a lethal attack, just because you’re a little older! where do you put the bulls eye in relation to front sight. ie: on top; hidden behind. Is this something Lasic surgery can help? If a person meets the eligibility requirement, passes the doctor’s screening process for laser eye surgery and has the procedure then yes it should. I got Lasik and it made it worse. I have this problem in a big way now. I have 20/15 vision which is great for all the outdoor activiities I love. I just can’t seem to deal with this lack of focus on the front sight. The sights are just a blur. It is frustrating. I read through these comments and will just need to practice more with blurry sights and a clear target. After a certain age, Lasik is a scam. I had this conversation with half a dozen eye doctors. The only one that suggested surgery for old eyes was the guy who did the surgery. No, LASIK, when done normally ends up with perfect far vision (20/20 or better). You still won’t be able to focus on the front sight. I had lasik and can read the name on a golf ball at 300 yards with 20/15 vision, but can’t see my watch without reading glasses. The solution: if you want lasik have one eye fixed for distance and one eye fixed for close in. The brain adapts to the different input quickly and then you can read and see distance without glasses of cocking your head up and back. I have never heard of that before and that is what I did. A lot of people have different levels of visions in each eye and the brain always makes the adjustment. The problem is that with Lasik you lose your nearsightedness which means if you correct your dominant eye, you will still have problems seeing your front sight post. great article! Helping my wife was easier after reading this article. Good article. Filing the rear sight on my 1911 did the trick for these 64 yr old eyes Thanks! With dominate hand holding the pistol point index finger at target and line up front site on target. As pistol is leveled on target you are lined up for a torso hit. Try it, it works. I could not focus on my front sight and my groups were spraying all over the target. groups are much better now! Found this works great while shooting IDPA. With trifocals, and keeping the front sight in focus, I could not distinguish between the bad guy and a no-shoot beyond about 5 yards. Switching focus to target made all the difference in the world. I sometimes still shoot the no-shoot but that’s generally a trigger problem, not focus. Hi Dave. This sounds like a cool thing to try. Even if it doesn’t work for me, I still get to benefit from the meditative aspect of the exercise. One question – with or without glasses? I’m thinking I should be learning to hit a target without my glasses for the simple fact that I may not have them or lose ability to see through them at the time. a good target to practice with? One thing to consider is reverse bifocals (and not transition). Have your optometrist set the near distant focal point for about where your front sight will be when you shoot. This will provide a sharp front sight (like the old days) and allow you to assume a combat shooting position with your head tilted slightly forward. Hi, good points all around. I have the bifocals focus problem too. Try this, go to the Dollar Store and buy several different powered bifocals. take out the lens for your non site eye. You will be able to focus on the target and your sites. If your dominant eye is your right, and you are right handed, this works very well. If dominant eye is left and you are right handed, you’ll see the target on an angle from your right eye looking at the sites. Give it a try. Thank you for this excellent article. I have exactly the problem that you have outlined and resolved. I am 64 years of age and although my long sight is almost as good as it was years ago,my vision over short distance(front sight to rear sight) has deteriorated quite a bit. I was trawling the internet searching for some form of eye glasses that might help with the problem when I discovered your article. You may have saved me a lot of time and possibly quite a bit of money. What is your take on Red Dot sights? It’s funny. I have always been a target shooter, instead allowing the sights to blur. I just got back into long range shooting after 15 years out of the sport. Nearing 50, not able to see the rear sights like I used to, I still shoot as well as I ever did with my rifles. Thanks for putting some fears to rest regarding aging eyesight. I’m new to pistols, but I’ve had this same issue shooting open ridle sights for years. With practice, I now shoot with both eyes open, and it helped a ton. My dominant eye sees the sights, and my other eye sees the target. This causes you to see double on the front sight, but once you know which of them to use, it works great dor me. Is there any reason that I should use a different method shooting pistols? At 67, I have this problem and appreciate your potential solutions. I will certainly try them. Would the addition of the Crimson Trace laser grips solve this problem? Before spending money on a laser try the methods recommended in the article. Changing out your sights so that you have a wider rear notch combined with a highly visible front (such as a fiber) can do wonders in helping with traditional sight alignment and sight picture (SA/SP). If you’re still not able to get sufficient SA/SP then the threat focused technique described in the article should work well with some solid practice. If you still want to add a laser after you have developed the ability to hit targets using the threat focused sighted method then go for it. Keep in mind the laser is considered a tertiary aiming device and you need a maintain that reliable primary method of hitting targets which require high degree of precision. Also, keep in mind that lasers have limitations in effective distances, washout in bright light, battery failure, and depending on the type they can be difficult to get turned on in that worst case scenario. I have included some PDN videos that cover laser sights on defensive handguns. In a defensive situation, getting a good sight picture in milliseconds under the stress of the situation is going to be difficult even for the best eyes. Learn point shooting and practice often at differing distances, shot placements, follow ups, lighting and weak hand. Much faster and more accurate. This is a great subject. I wear tri-focal lens in my glasses. That makes it even harder to get a good view of the target and/or the sights. I find it exceptionally hard to use a rifle, but now I see there are better sights (Red Dot, etc). I just might try that some day. As to my revolver, maybe getting a laser pointer and concentrating on that would work. I have always found looking at the target to be natural. At age 53, I decided to try looking at the front sight and it feels completely unnatural. This is the first article I have read about focusing on the target. Nice article. You can also use a laser sight. Well written article that really works. Before reading this, I found myself letting my sights go out of focus and concentrating on the target (53 year old eyes). It really does work. The last time at the range, I had nice tight consistant groups. Give it a go!! What’s your thoughts on lasers? I wear Trifocals and do have the issue you described. I have to tilt my head back to focus on the front sight. This is very uncomfortable and as you said not practical in a real world situation. Hi, Roger. The laser on a defensive handgun would be classified as a tertiary aiming method. They are most useful when shooting from an unorthodox position where the gun cannot be put into and parallel with your line of sight. What you are describing is very common and was addressed in the following PDN article. These Glasses were designed at the request of pistol shooters and instructors. These are designed for people who are far sighted and need readers to help see things up close. This product even has interchangeable lenses that allow you to switch out one lens with a regular “pano” lens to still see your target while the other lens can contain the bi focal at the top of the lens to help you see your sites. Excellent discussion. I need to get busy using the info! On my AR-15 I had optic sight installed which does wonders for see and sighting. Ifneed be I can look ove the top of the optic sight and align the front site . I had a stroke that greatly affected my vision, nothing else just my vision. You can never tell! Many years ago in the military on a special duty assignment, we were taught a point and shoot technique. It was not so much for target shooting, but more for quick combat engagement, or when using plain old military sights, long before all the fancy illuminated sights were around. It was a must in low, or no light situations. The whole key for me was to figure out what works for you. Example, at 25 yards for me, I concentrate lower and to my left of center mass, (or at least it feels that way), but my rounds impact in center mass. I never even see the sights. I believe this method was also taught in WWII to British agents. I’m not sure what they called the method. Aiming at the target. Putting shot in similar to a right punch left jab. After having perfect vision my whole life, at around 40 years old I started to lose my near vision, then a few years later I developed presbyopia. I am still “legal” do drive but not comfortable doing so. I am now wearing trifocals or Cooper Biofinity multifocal contacts (which still require readers for fine print). I can see both rifle & pistol sights fine in fair to good light when wearing either. 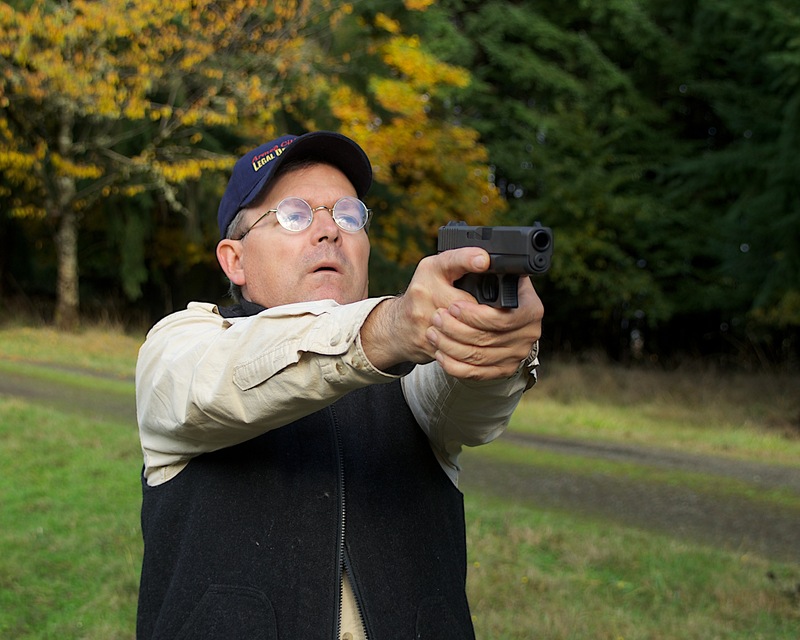 I was one of the top 3 shooters in my CCW qualification class wearing the trifocals. I did put Crimson Trace laser grips on my primary carry weapons for night use or if I happen to be without glasses or contacts, and I put some of my niece’s super hard, bright fluorescent nail polish on the sights on my Ruger Service Six (house gun). One thing to try is a “Brock string”. Google it and make your own. It’s essentially 3 beads on a string set a different distances. You force your eyes to focus at those distances and change them as your focus gets better. It helped me out when I first noticed I needed cheaters to read labels. Right about that time the front sight started to get a little hazy. 3 times a day with the string made a world of difference. When I went to the Police Academy in 69, I was taught to shoot instinctively, from the draw, at seven yards. Crouching slightly with forearm parallel to the ground, and looking where you want the bullet to hit as you are pointing your handgun at that spot. With practice it worked well with a 4 inch revolver. I’m 68 now and using a 1911 in the same manner. Great article. I too found that the “looking through” the sights:and superimposed on the sharp target you described to be “right on”. Practicing to consistantly reinforce muscle memory by fully extending and fire with 2 hand position …the front and rear sights align properly for dead center. That combined with replacing my Glock sights with the Ameriglo Spartan O/G Set For Glock .These are tritium Night sights with a Bright orange outline front sight that really “Pops” in the daylight. I also pickup the bonus of being night sights that helps in low light on the range or in the house. I am surprised that there has been no mention of the ghost ring rear sight. I have one on my 1911. The ring is large enough that you can see through it at arms length. If you can see the front sight through the ring, you’re on target and can get very good groups. I think people are confusing 2 issues #1 target shooting, use your glasses etc, #2 personal protection, I am practicing with no glasses, one eye the non dominate can focus on the sites, my right eye can’t but very clear at distance. shot right eye and both eyes and all glock 17 shots were on the silhouette but i want to try a few other things but I think for home protection it’s a no glasses, just woke up (close eyes for a bit) then draw and shoot. SPEAKING ABOUT THE GLOCK. THEY HAVE OLD MAN SIGHTS. REAR HAS A WIDE SQUARE. THE FRONT IS BRIGHT ORANGE. IN DAY LIGHT. I DON’T NEED MY READING GLASS’S I PUT STRAIG EIGHT NIGHT SITES AND A LASER GRIP ON MY G-1. WITH OUT GLASS’S IN ADRAK RANGE, I USE INSTICTIVE SHOOTING. TAKES A LOT OF PRACTICE AND MENTAL CONCINTRATION. WHAT YOU SEE, YOUR HAND POINTS IN THAT SPOT. LIKE THROWING DRATS. CONSINTRAYTE ON THE BULLEYE AND KEEP IT THERE UNTIL AFTER THE DART HAS BEEN TOSSED. THANKS TO 40+ YEARS OF MARSHAL ARTS, I HAVE THAT POINT AND SHOOT WHAT YOUR EYES’S SEE. IF YOU GO FOR AN EYE POKE YOU NEVER TAKE YOUR EYES OFF THE EYE. OR YOU WILL HIT THE CHECK BONE. What about attaching laser sights to the firearm? I have extreme myopia (20/2800) and was taught to shoot by LEO and security personnel when I was in my mid-20’s, back in the mid-1970’s. I am in my mis-60’s now and have developed presbyopia. I started to teach shooting about 15 years ago, at first informally, but eventually got my NRA Certs. I never thought much about how I aimed until I went to Front Sight for their 4-day Defensive Handgun Course. They tried to get me to shoot with the Weaver stance and grip and to focus on the front sight, both of which were nigh onto impossible for me to do… and still are. I wear progressive trifocals and prefer to focus on the threat (the target) with both eyes open for defensive shooting. That way, I can identify the threat, keep track of what the threat and his buddies are doing and have periferal vision. Also, my stance is the same for rifle, shotgun and pistol, i.e., my strong side foot is always about half a step behind my off-side foot so I am slightly “bladed” with my carry side away from the threat. It keeps me better balanced than standing square to the target do recoil doesn’t affect my balance and I use my off-side knee as a shock absorber for the recoil, whether shooting a handgun or a 12 ga. If I am doing precision shooting at a still target or at long distances, then I close my non-dominant eye and switch my focus between the front sight and the target while trying to steady my breathing. That stance also makes it easier to start running. 8^). I actually learned to shoot that way when we took up Cowboy Action Shooting about 15 years ago. As for Lasik surgery, the only way it will help for shooting is to get “mono-vision” where one eye is corrected for distance and the other is corrected for reading. The problem then becomes adjusting to that and the loss of depth perception. Since my vision is so bad, I have always had trouble with depth perception, so I have never even been tempted to get Lasik done, although I did do some research on it about 8 years ago. Since it is not reversible, I decided it wasn’t for me. I am already practically blind and did not want to risk what little vision I have. I have taught many new shooters to focus on the target, both adults and kids. It seems to work especially well for adults. Now, thanks to this article, I understand why. BTW, if you absolutely need reading glasses for shooting, try getting a pair made with one lens corrected for your front sight’s distance from your eye and the other lens plain or see if you can get a pair made with the bifocal separation done vertically instead of horizontally. That way, instead of tipping your head, you can turn it slightly and you won’t mess up your balance. I have progressive lenses, and have no focus problems for the front sight or the target. This is exactly my problem. I will give this a try. Thanks!! Very good article–excellent explanations and tips. Hope you can help ! I’m going thru this with my eyes I’m 67.